Why do I get different calibration results in my laboratory? What is the recommended routine maintenance for an MLA pipette? (1) Remove, clean, inspect and replace the nozzle insert as needed. (3) Lubricate the plunger with silicon oil and replace the inner piston seals as needed. How often should routine maintenance and calibration be performed? VistaLab recommends performing routine maintenance every 6-12 months depending on frequency and conditions of use. 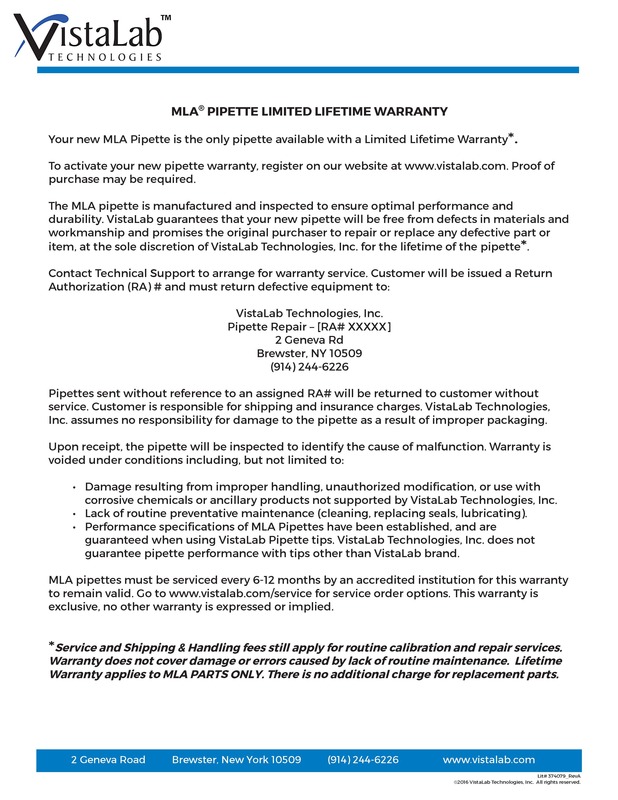 Are parts available for MLA pipettes? Normal ‘wear’ maintenance parts such as nozzle inserts and seal kits are available for purchase in the Support section. Parts, such as nozzle assemblies or plunger springs, are not available. However, when sending the MLA pipette to VistaLab for service, any parts needed are replaced at no additional charge. Complete information about our calibration and repair services is available in the Service area of this web site. Can MLA pipettes be calibrated by the user? Yes. 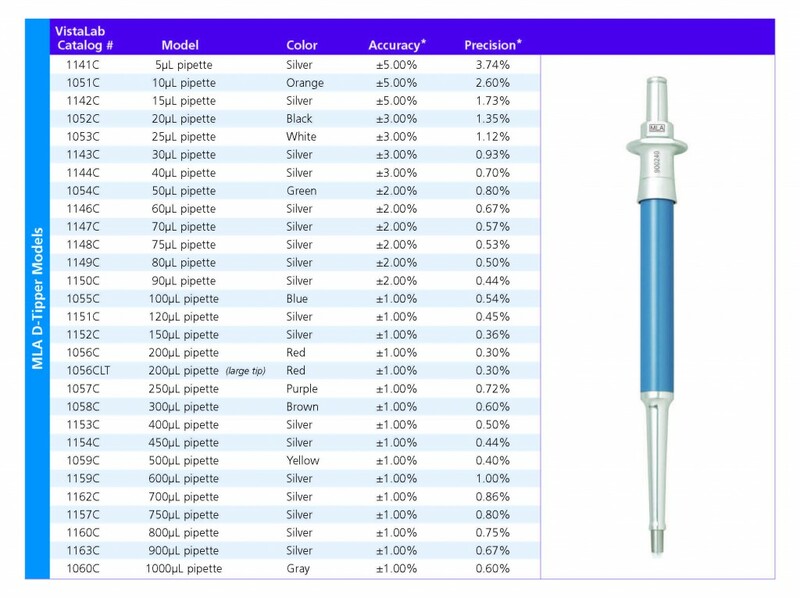 All MLA pipettes, except those with a selectable volume feature, can be easily calibrated by the user. 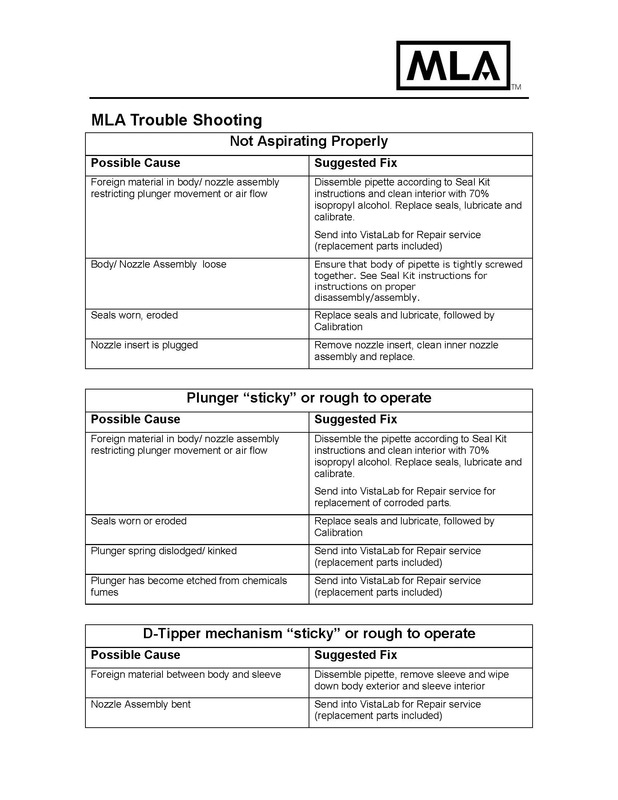 The recommended procedure can be found in the models Operators Guide. How do I send in an MLA pipette for calibration, maintenance or repair? Go to Service Order page via the internet and input all necessary billing, shipping and product (Model, Serial number, Service Level) information. Once Order is placed, check your email for Order Confirmation page, print and sign decontamination statement, and include in packaging with pipette and send in to our address. Customer responsible for shipping charges to and from facility. 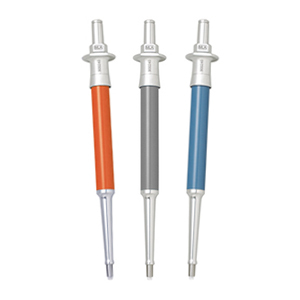 Do Ovation tips fit MLA pipettes? Do MLA tips fit the Ovation pipettes? Are MLA Pipettes “air displacement” or “positive displacement” pipettes?